Followed by Google and Facebook, iPhone maker also introduces a system of two-factor authentication for their online services. 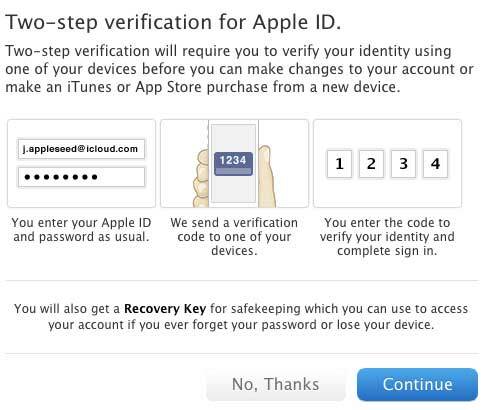 While the two-step authentication is implemented for the service iCloud. As described in the Apple, the implementation of this task is to prevent the use of iCloud-data with unauthorized devices. In addition, the presence of systems to enhance the authentication system, increase the attractiveness of iCloud for enterprise users. Now users can use two-factor authentication in the account settings in the tabs Apple ID Password and Security. In the case of two-factor authentication from Apple, users can obtain an authentication code by SMS or discover it on your special application for iPhone – Find My iPhone. Both solutions allow iCloud to ensure that their use of the device has a legitimate right of access iCloud. At present, the system of two-factor authentication is only available to users in the U.S., UK, Australia, Ireland and New Zealand. Soon Apple intends to launch a new wave of countries. The company promises that the two-factor authentication system users will also be convenient as they do not have to work with the so-called test questions. Analysts say that the introduction of enhanced autientifikatsii is also the kind of application for the wider use of its services in the corporate world, as well as a competitive advantage, equalizing with other popular iCloud storage services such as SkyDrive or Dropbox. Apple this week launched two-factor authentication for iCloud and Apple IDs.